Diamond studded Claddagh necklace is crafted in 14K white gold. Sorry, this diamond Claddagh necklace is now sold out. 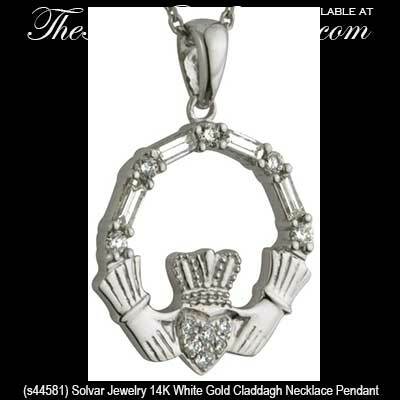 This 14K white gold Claddagh necklace features just shy of 1/3 carat diamonds. The 0.32ct. diamonds are featured in the heart along with along the top ring and these stones are have a clarity grade of SI 1 and are G - H on the color scale. 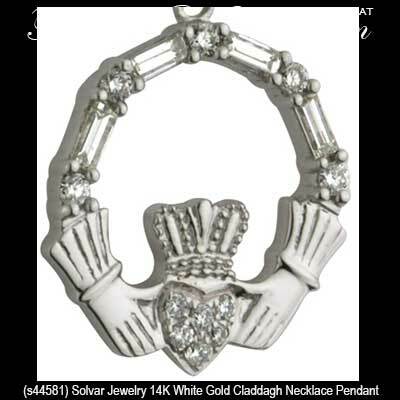 The diamond Claddagh pendant measures 5/8" wide x 7/8" tall, including the jump ring and the chain bail, and it included an 18” long 14K white gold chain.